First up…Just as I was preparing to write a newsletter several weeks ago, my computer blew up and I have basically been running everything here on an 8 year old laptop until this past weekend…making the idea of composing anything virtually impossible. At any rate, here I am again…A lot has happened since my April 3rd letter, and a lot is still happening but I am going to try to keep this brief…mostly just charts. 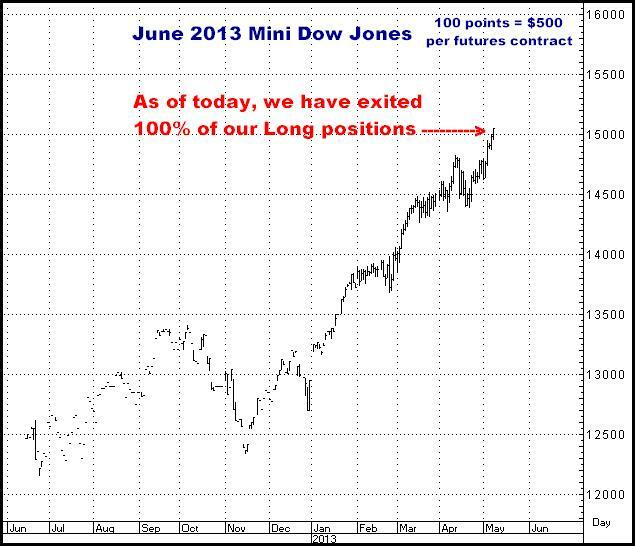 We exited all long positions in the Stock Indices yesterday. as a trader, this is a good place to stand aside. 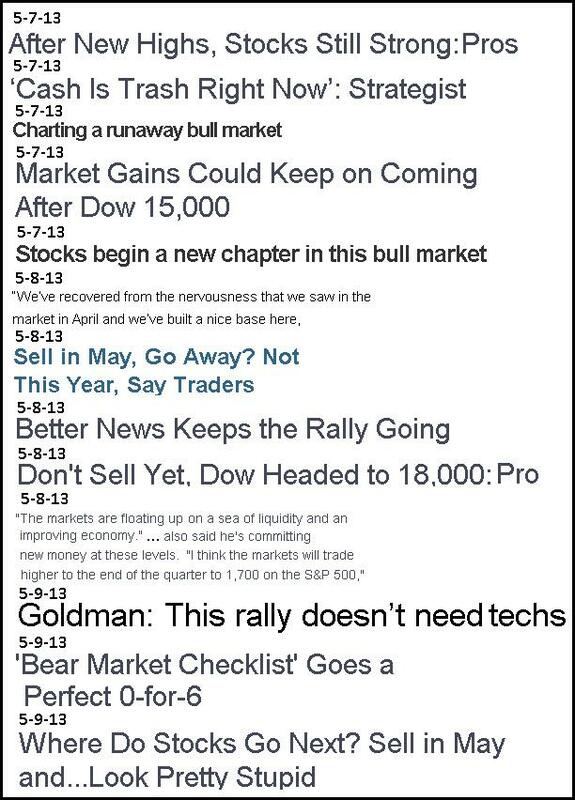 The headlines, FOREVER, have been “Don’t buy it here”, “Bear market coming”, “Correction ahead”, “It’s only up because of the Fed”, “No job growth”, “The economy is slowing down”, etc., etc., ETCETERA…DOUBT has been everywhere. Without elaborating, I will say I think that doubt has very recently turned to “glee”, and all those same people who formerly hated the market, are NOW certain 15,000 is solidly behind us and stocks can only be moving higher for the remainder of 2013. With aggressive accounts, I may be going short this market for a while, but my official recommendation is, “Take profits on long positions and move to the sidelines”. At any rate…We have sold all long positions…and to be honest, today, probably stupidly, turned it around and went short (using 2 puts vs 1 call). 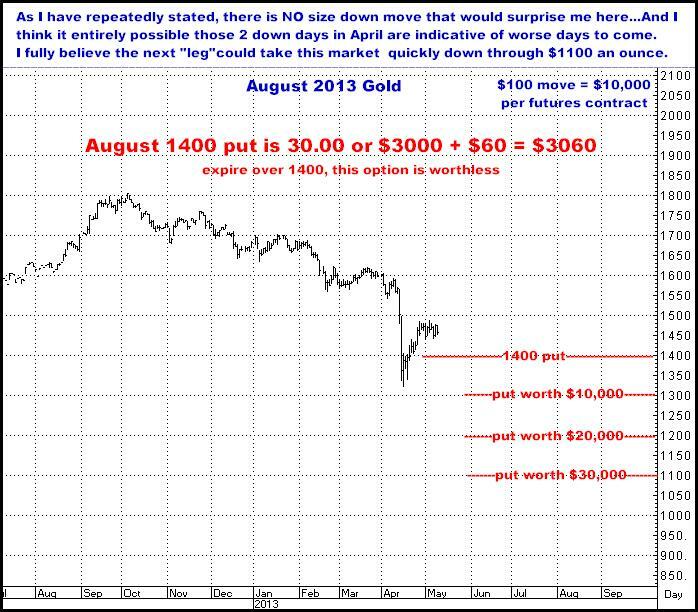 Early last month, Gold famously had its biggest 2 day sell off ever, having fallen $230 an ounce on April 12 & 15th. It has since recovered roughly half of that drop. We are still short and still buying puts. I continue to believe Gold is severely overpriced, and in today’s electronic world (where $10 billion can be transferred with the click of a mouse), the idea of Gold ever replacing currencies, or being perceived as a last resort hedge against inflation…or safe haven in the event of world economic collapse…is nothing more than an antiquated notion that will eventually go the way of the horse and buggy. It’s shiny, pretty and makes for nice jewelry. And it does have industrial uses. 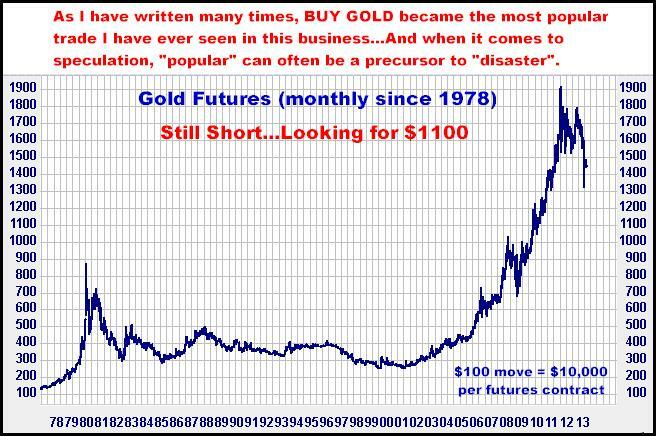 Beyond that, to me, it’s just another market that has had its day…I came into this business in 1980, the last time Gold had a big run, then watched it die for 20 years…And I pretty much think that will be the case again for the foreseeable future. 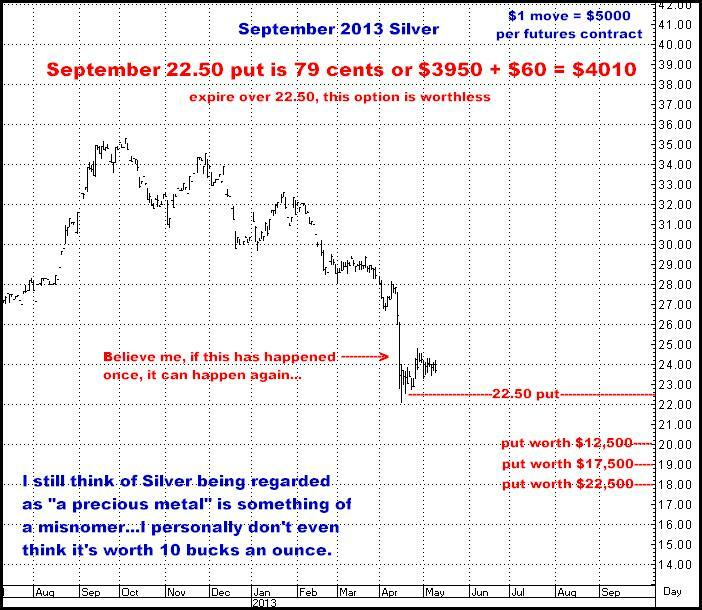 There will be times to be short, and times to be long, but over the long term, I believe actually owning Gold and Silver will be a losing investment. I'm sure many people think Gold has already fallen "a lot", but as I look at the long term chart below, all I can think is, “Nothing has really happened yet”….As late as last December, virtually every brokerage house (beware!) 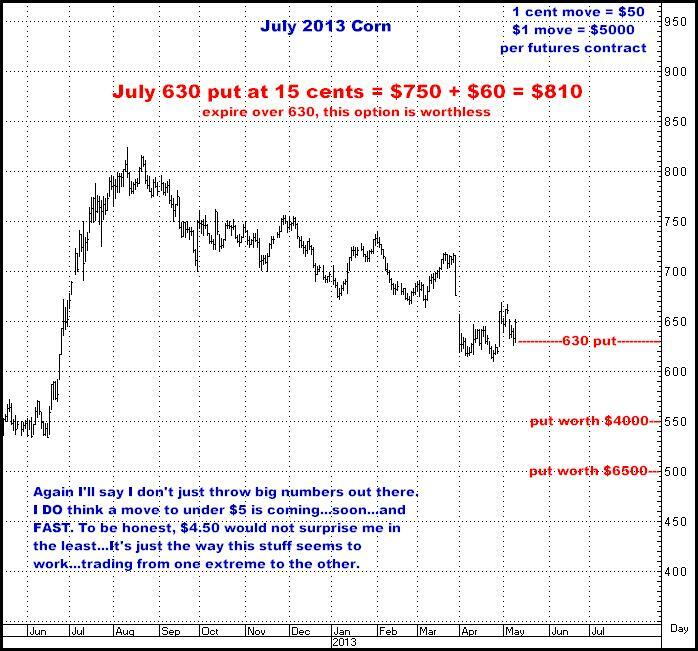 on the planet was calling for higher gold prices in 2013...As there has been a 10 year build up of hype in this market, I seriously doubt it has even BEGUN to be liquidated...I believe that five years from now, the idea, "you gotta own some gold", will be DEAD as an investment concept. I have heard the “tight supplies” story so many times since last summer that it has truly become laughable. 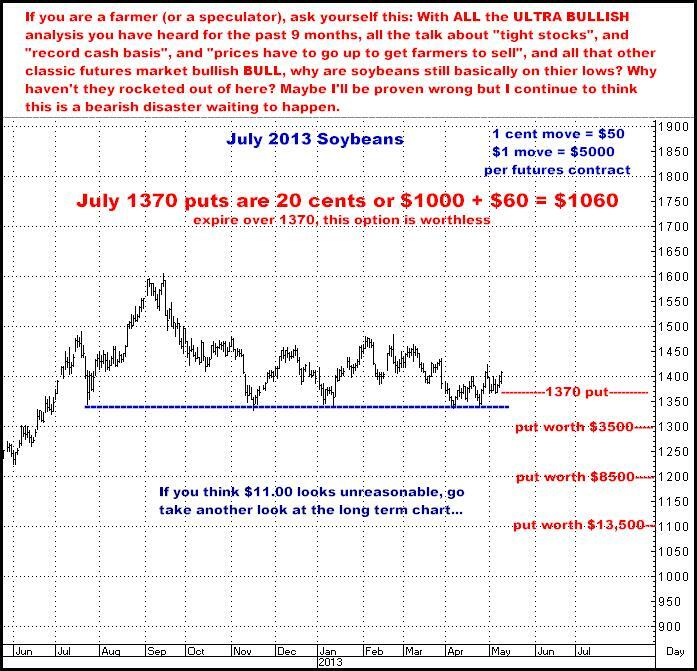 Assuredly, I may end up being the fool but I am fairly certain all those supposedly bullish fundamentals have LONG, LONG, LONG since been accounted for in the market…that buyers and end users have already covered their needs (buying) out through summer’s end, while farmers, worldwide, are still sitting on a mountain of product that HAS to be sold between now and this fall’s harvest…They’ve been waiting for magically higher prices to sell their Corn and Soybeans, but instead, I believe, in coming months are going to find themselves selling, along with everybody else, into a falling market devoid of buyers. I continue to view both of these markets as sitting on a well delineated cliff (see July charts below), and once those noted levels have been cracked, there is no telling how fast and far these markets will fall between now and expiration of the July contracts. Weather can always be a factor with these two crops…And bad weather would almost certainly send both of these markets roaring back towards their highs. 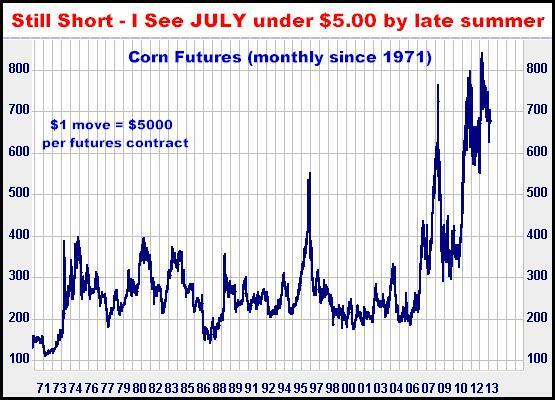 Conversely, I think any degree of normal weather is going to leave these markets with nowhere to go but down, a LOT, between now and summer’s end. For this reason, using the “Both Sides Strategy” (2 puts with 1 call) makes tremendous sense here…I haven’t shown you any numbers here but I am almost exclusively using the strategy with all the positions currently held here…Call if you want more details. 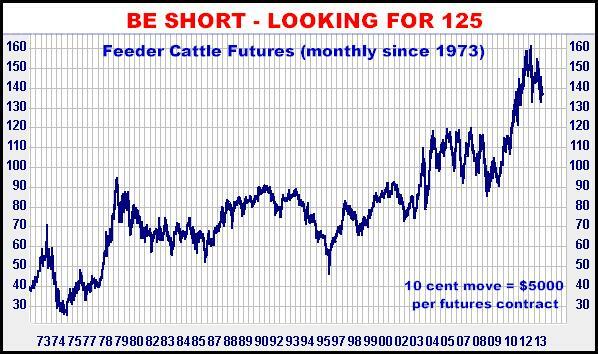 There is a “big” USDA report coming out at 12:00 PM tomorrow (Friday), which may result in sharp price movement, meaning the option prices shown here may no longer be available. If you do have an interest here, you might want to contact me ahead of the report…or after, for that matter. And one more time…If the yearlong steady drumbeat of bullish hype is to be believed, WHY are these markets essentially still sitting here ON THEIR LOWS? 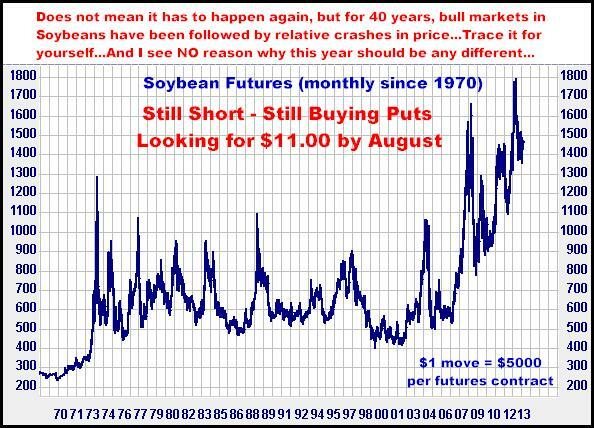 According to what I read, they have had a 1000 reasons to go up…and they haven’t…I SERIOUSLY DOUBT THE NEXT 2-3 MONTHS WILL BE SIDEWAYS…AND I JUST AS SERIOUSLY DOUBT THE NEXT MOVE IS UP…MAYBE I AM DEAD WRONG BUT I DO THINK CORN AND SOYBEANS ARE GOING SERIOUSLY IN THE TANK. 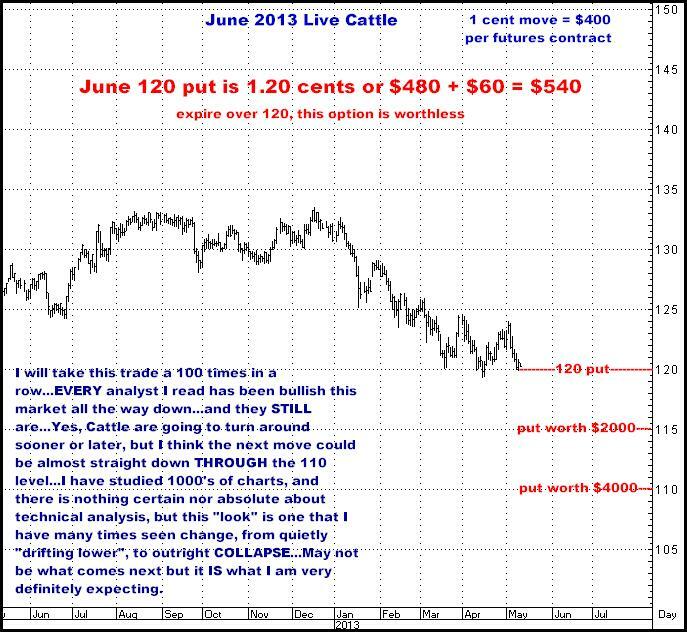 In other words, I think the cattle markets are maybe about to go as straight down as futures markets ever do…And I promise you, if I am right, to the average cattleman or cattle trader, what happens next will potentially defy all “logic”…But as I have often stated, the Meats almost routinely seem to make dumbfoundingly enormous moves, and more often than not, nobody ever understands why (if at all) until well after the fact. That’s it…I’m obviously biased but I think there are some great ideas here. 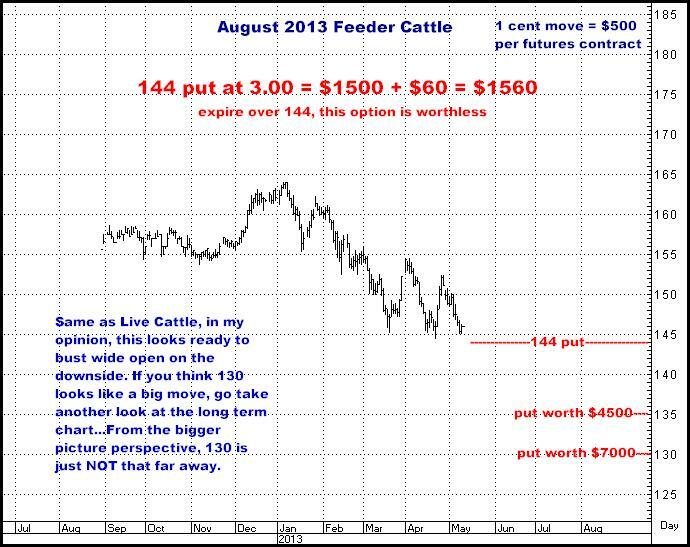 If you have capital to RISK, I encourage you to give me a call and look at some numbers. I think the next 3-4 months are going to be anything but “quiet”.